Happenings with Z5: Happy Thanksgiving! 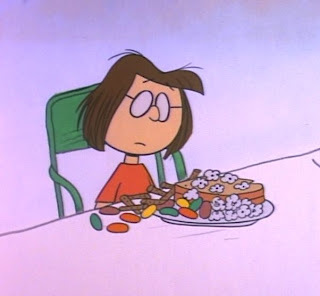 Matty & I watched the Charlie Brown Thanksgiving special last night. A pre-Thanksgiving tradition we enjoy. 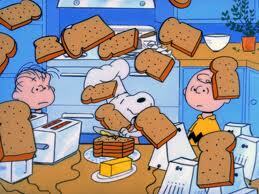 I love how Snoopy cooks the entire meal of toast, popcorn, pretzel sticks & jelly beans. Marcy. One of my favorite Peanuts characters. Here is what Omid is cooking for our Thanksgiving dinner: Two turkeys (one in a cherry juice brine, the other traditional with olive oil, butter & herb rub; one ham, cranberry rice (the Persian element in our dinner). I am in charge of mashed potatoes, roasted carrots/asparagus, mealy pudding (Scotch dressing). We usually stuff the turkey with the dressing, but since the turkeys will be smoking in the Traeger, I will have to put the dressing in a loaf pan & bake it. It still tastes good. It is however, NOT Thanksgiving without Scotch dressing. I load my plate with the dressing, cranberry rice & cranberry sauce. That is my own Thanksgiving tradition. Those are the best parts of the dinner for me. Everything else I will take a little taste of. Dessert will be two of B's famous apple pies + a pumpkin pie from Costco (thanks mom/dad!). Wishing you & yours a very happy Thanksgiving! Don't forget! Apple Cup is at 12:30 p.m. on Friday & will be televised on FOX.